This engineering qualification will prepare you to join the growing world of technology by developing the skills you’ll need to succeed and enhancing your career prospects. The programme has been developed in response to the requirements of employers, both locally and worldwide, to provide the skills that a new generation of engineers require. You will learn in our fully equipped workshops and additive manufacturing suite, which includes computer numerically controlled (CNC) machines, computer-aided design (CAD) software and our industry-standard 3D printer. The course incorporates a Higher National Certificate (HNC) as part of the first year of study, and is available as a full-time or part-time programme of study. There are flexible delivery options to ensure minimal impact on your existing responsibilities, including employment. You will be taught through a variety of methods, which will vary by module. These will include tutorials, laboratory work, and practical tasks on industry-standard software and industrial equipment. Our engineering workshops feature CNC machines; CAD software; 3D printers; centre lathes; vertical, horizontal and universal milling machines; and a fully equipped grinding section. This provides the opportunity, not usually found in universities, to engage in hands-on practical activities to enhance taught subjects. 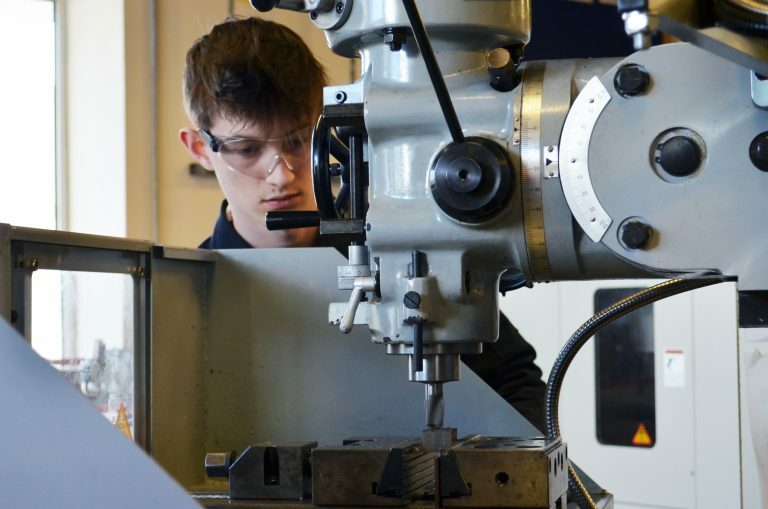 Students who successfully complete the HNC Manufacturing and Mechatronics Engineering may progress to stage 2 (Level 5) FdSc Manufacturing and Mechatronics Engineering or stage 2 (Level 5) of the BSc (Hons) Mechanical Design and Manufacture (Plymouth University). Students who successfully complete the FdSc Manufacturing and Mechatronics Engineering may progress to stage 3 (Level 6) of the BSc (Hons) Mechanical Design and Manufacture (Plymouth University).